“Many of the teachers that were surveyed didn’t think that financial education was an important concept,” said Brian Cullinan, the market managing partner for the auditing firm Pricewaterhouse Cooper in Southern California, which sponsored the survey. I just read this quote from Despite new law, California lags in personal finance education and it turned my stomach. The reason I work so hard to reach people and teach them about personal finance is because most of them weren’t educated in that field in high school, undergrad or grad school. Apparently, they weren’t educated in it because teachers don’t think that it’s important. According to the article, fewer than 10% of teachers teach personal finance in California. When you’re calling about speaking to a group of students, often the teacher will ignore your call or not prioritize your event. Now, I know why. This makes it even more important to educate your children about personal finance outside of school. Take ’em to a workshop. Register ’em for a webinar. Buy ’em a book. Talk with them about your successes and challenges. Do SOMETHING to make sure they don’t have to learn the hard way like most of us did. 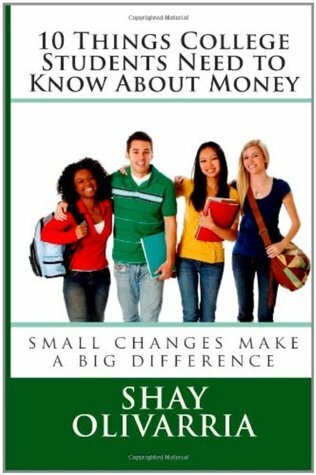 Save 30% when you pre-order the 2nd edition of 10 Things College Students Need to Know About Money directly from Shay. Order your copy of 10 Things College Students Need to Know About Money for $10 today! You can also purchase the book for full price at Amazon.com. I am so excited about the second edition of 10 Things College Students Need to Know About Money that I’m doing something I’ve never done before: offering a pre-order. The book will be available on Amazon.com for $15 (you’re saving 30%) so order now to take advantage of this fantastic deal. Graduation is around the corner for most high school students and I want to make sure that the books you order make it out in time to give as gifts. To that end, if you pre-order your copies of 10 Things College Students Need to Know About Money on June 7th or before, you can buy each book for $10 and you’ll be invited to a special Thank You Webinar! I’ll solicit questions through an email survey after you purchase and then make the webinar about the topics you want to cover. If you order before May 27th, your books will ship Saturday, May 28th. Don’t worry, you’ll have your copy in time to participate in the virtual book launch. Don’t forget to share this post! We want everyone to know about this great resource. If those two quotes aren’t enough to get to start investing, I don’t know what else to do. Those quotes tell us that women are AWESOME at investing and that heterosexual women are going to have a substantial amount of time not married (at least our 20s and ten, fifteen, perhaps 20 years after our partners die). What are you waiting for? Start investing now. If your job offers you a 401k or 403b (tax benefits and usually matching) start contributing now. Call HR. Now. If you’re worried about how much money is going to start coming out of your check, start by contributing just 1% and increase your contribution percentage a bit every year. If your job doesn’t offer you a retirement plan, open an Individual Retirement Account (IRA) as soon as possible. Depending on whether you choose traditional or Roth there are tax benefits now or tax benefits later. You won’t get the matching but you will get to take advantage of compound interest. Not sure where to begin? Find a fee-only advisor and get hopping! If you’re 30 years old and can contribute $415 per month you can build a million dollar nest egg by the time you retire at 67 years old. Can’t contribute that much? No worries. Something is better than nothing. If your nest egg ends up smaller than you’d like, you can partner your investments with your Social Security payments and go live in one of these 8 beautiful countries. Either way, it’s time to get hopping.